After coming up with some coping techniques for my excessive eating, I've had a good couple of days. I've become more conscious of what I want to eat, what I'm going to eat, and how eating something has made me feel. Making sure I drink my water! I've gone over my daily calories still, but not like I have been. It's been more like 400 calories over instead of 1600 calories over a day. That stuff adds up! I also braved the scale today AFTER I had breakfast and coffee. I almost didn't do it, using already eating as an excuse. I'm at the same weight I was at the beginning of last week, which was good news since I had been up a few pounds. Hopefully staying on track will help me drop one-ish pounds this week. Seriously. There's a Gosling Meme for everything. Becky and I had plans to either run outside or meet at the gym. The weather has been rainy and dreary here, so we met at the gym. I really didn't feel like running on a treadmill, so checked the class schedule. 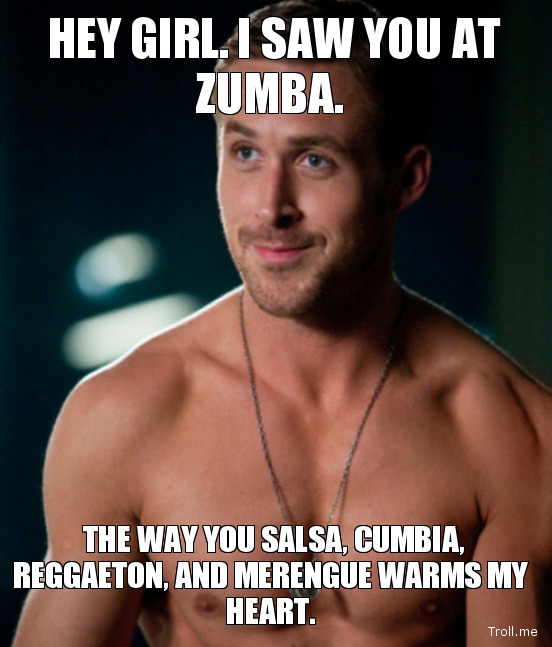 There was a Zumba class starting right when we would be getting there. We went to the class and it was packed! The teacher was SO full of energy, had amazingly fun songs, and the whole class seemed to come regularly because they all seemed to know the routines. I haven't sweat that much in a long time! It was a nice change-up. I also started doing a plank a day challenge. Yesterday I did one for about 20 seconds. Today, I managed to hold it for 41. Those things are beasts! Here's to a great and healthy week!